The final lap of a race, as at a track meet, signaled by the ringing of a bell as the leader begins the last lap. Stories in The Bell Lap share of some of the life-changes that come with age and illness. Bell Lap moments are recognizable to families who find themselves caring for their loved ones, as well as to the professionals caring for their patients. Some stories are songs of jubilation, holding moments of courage, or of cunning, still others of acceptance and death, others in the realization of life’s newly opened paths. All of us with families and with patients already know something of these stories. The Bell Lap allows us all – students, families and caregivers – to discover who our patients are, and were, and what we need to do to provide optimum care, comfort and -maybe – safety in this new reality. It is in caring, even as untrained family members, and to different degrees, that we all practice the art of nursing. At some point in life’s journey each of us enters our Bell Lap. How does it happen? Do we recognize it when it does happen? How do we accept or kick against it? Or, as in Graham’s own words in the Prologue, how do we face, for ourselves and those we love, the two somewhat but not entirely compatible tasks: living longer and dying well. While some of the stories are about patients, others focus on the caregivers – those coping with loved ones and off times left behind. They connect families, communities, doctors, nurses and caregivers as they work together. They seek out where compassion and empathy for the patient is to be found within the various medical systems and communities, bringing the grace and safely we all long for. As the economic pressures of the health care systems in the western world bear down on the providers, those pressures are threatening the arts of nursing and medicine. Physicians may come and go, moving quickly on from the bedside. With luck however, it will be a nurse who watches over you, soothes and succors you, guiding you back to life or beyond. The Bell Lap is published by CRC Press at the Taylor and Francis Group and is available from mid-March 2016. 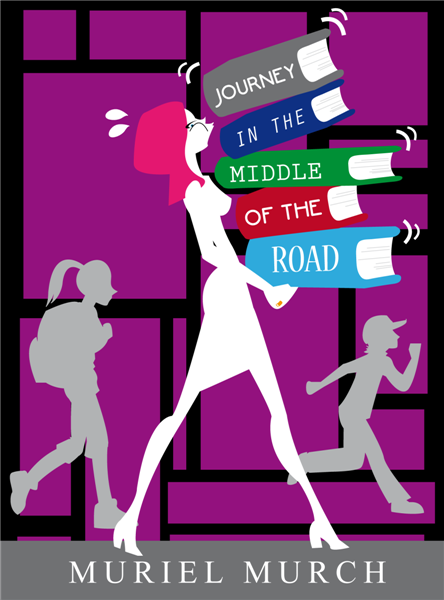 Journey in the Middle of the Road; One Woman’s Path Through a Midlife Education is an epistolary account of the four years it took the author to upgrade her Registered Nursing diploma to a Bachelor of Science degree. Returning to the local community college and then the state university in mid-life proved an exciting and terrifying challenge. Along the way she discovers that the learning difficulties that have plagued her throughout her entire life have a name, Dyslexia, and a solution that she must embrace. Humiliation is buffered by friendship while life pulls, tugs and tempts her away. But she will not be dissuaded from this path and finds a way through the maze of bureaucracy to succeed in her goal. For many who set sail on this voyage the charted-destination is not always the port to which gives safe harbor. When this happens it is a gift of our own making. Muriel Murch’s story is a universal womans story — re-examining a long-term marriage, experiencing your children leaving home, returning to school as an adult, searching for your next life challenge, and facing mortality. Her lyrical writing style is engrossing and her honesty reveals life’s truths. An inspiring, epislatory memoir. You wont forget this life! — — Michael Ondaajte, author, The English Patient, and winner of the Booker prize for literature. The Other Side of the Bed. This was written in 2010 after a complete left knee replacement at St. Mary’s Hospital in San Fransisco. The care there was amazing, and the medication took me back into memory and thus story ….